ZHU NI XIN NIAN KUAI LE!!! 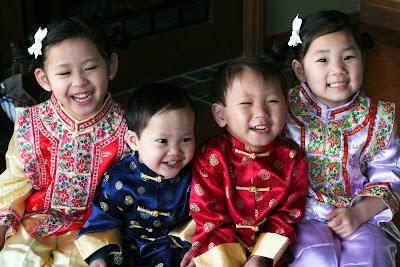 Gorgeous kiddos…..Happy New Year to you too…. The pictures of the children are precious! They are just so adorable!! I love the girls hair and their outfits are all precious. Happy CNY! Gorgeous, precious, fabulous! Great pics, thanks for sharing! they are absolutely stunning! 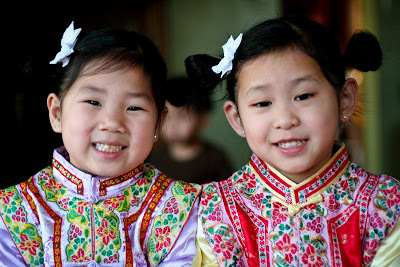 I have read your blog for a long long time, first saw it on myadoption website when you were adopting Sophie, my friend was adopting from China at the same time. I've never left you a comment before but the pictures are just beautiful. I also wanted to tell you that I read your post the other night about following God's plan for your life and how this blog fit into it. I want you to know that my 20 year old daughter would like to someday adopt a special needs child simply from reading your blog & the no hands but ours website. You have inspired my family & I'm sure so many others that you will never know about. God has blessed me many days by reading about you & your family. When you are feeling stressed or overwhelmed, just know that there are people out here reading that you may never hear from, but that doesn't mean you don't influence them in big ways. You have a God given gift & I am so glad you have chosen to share it. 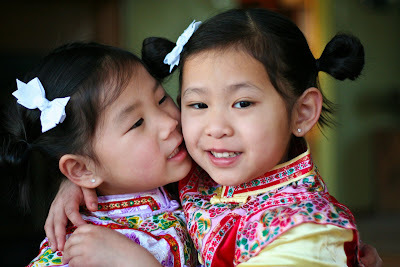 May many blessings come your way for the Chinese New Year. 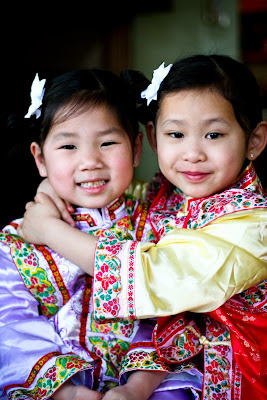 Gung Hay Fat Choy to y’all! 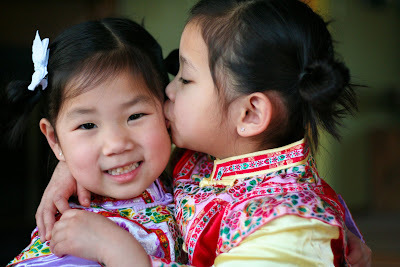 LOVE the picture of Isabelle kissing Sophie on the cheek! So sweet! Right back at ya! your kiddos are beautitful!!!!! Happy Chinese New Year to you as well. Just precious photo’s of your babies. Beautiful photos of gorgeous kiddos! 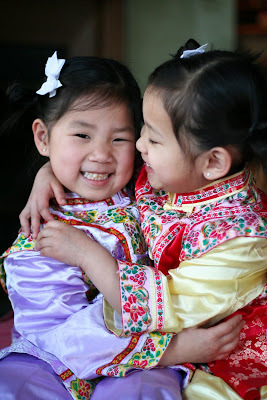 Gung Hay Fat Choy! Such beautiful pictures of your precious children! Oh my gosh, the are PRECIOUS!!!!! Happy CNY 2009 to you too! The photos (and kiddos) are just beautiful! I have been following your blog for some time now and I just love it! Thank you for sharing so much! Oh this MADE MY DAY!!! How GORGEOUS are your children!! Stef I just can’t tell you how seeing all of them warms my heart and yes, sparks that yearning in me for my baby girl!! Beautiful children!!! Where did you get the girls outfits? They are gorgeous. Right back at you! I love the girls outfits and hair. And the boys are very cute too! Love the pictures!! Way too cute!!! I LOVE the girls’ outfits. I so wish I had bought more of the dresses and pant/top combos while we were in China! They are adorable!!!! Happy New Year!!! 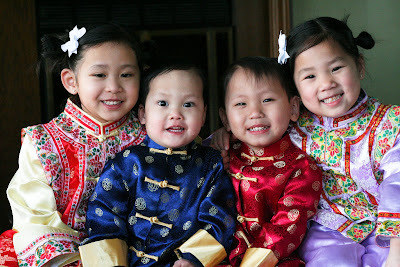 Look at those beautiful outfits…man we need to take a trip back to China just to load up on New Years clothing and if a little boy happens to climb in my suitcase home, you won’t hear me complaining 🙂 Oh how I am soooo ready!!!! I am so looking forward to sister photos like this. 新年快乐!!! They could not be any more adorable!! 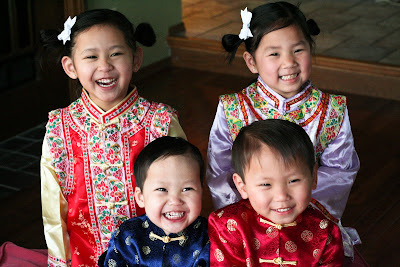 Happy Chinese New Years to your family too! Look at those beautiful faces!!!! Oh they are all just precious!!! setting aside the fact that they are adorable, they are just so happy! Happy New Year. GORGEOUS!!!!!!!! (both the kids and the photos!) I am making a special request for an update post on all your kids…how are they doing??? It was a pleasure to meet you and your sister (and Cole of course) in China recently. We had a little hiccup with Madeline getting pretty sick and the inauguration. Garrett is doing well and Gracie is a proud big sister. 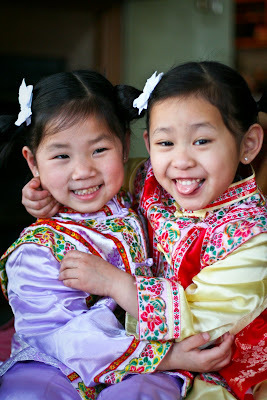 We’ve taken hundreds of photos, including some from Chinese New Years and some sledding today. Hope to keep in contact with you. Epin flies out tomorrow for Pax. We saw her on Sunday. Keep in touch!! I.have.been.away.too.long!!! I LOVE THESE PICTURES!!! I love your kids, they are just the sweetest and look positively gorgeous. TOO CUTE! !I MISS YOU GIRL! These pictures are georgous. what a beautiful family.